Here's my question to you. Say, you plan to launch a new website. When choosing a domain name, which extensions would you instantly consider? While I'm no mind reader, here are my guesses. .com. Obviously. The gold standard. .net. The most well known generic alternative, when .com isn't available. The country code of your country whether it is .fr, .de, co.uk, .it etc. Do let me know in the Comments below, if I read your mind ;). But wait... That mindset is outdated! This way of thinking worked in 2013. However we've moved on since then. The digital landscape is changing rapidly. The guys below from Duelo.Futbol get the new scenario. And you can too by reading the rest of this post. It's a fact that the internet landscape changed over the last 700 days. Let me explain why:+500 new domain endings have disrupted the domain name space. Now you finally get to choose domain names which communicate on both sides of the dot. They tell a story that a non descriptive .com or .net aren't able to. 6M registrations confirm this trend. That's one registration every 10 seconds. These new domain endings have the ability to create AWARENESS, COMMUNICATE and BRAND your business like never seen before. I admit it. I'm a personal fan of these, but only when used right. So read on to see how it should be done. I spoke to the guys behind the new site Duelo.Futbol. They explain here why they chose one of the new domain endings instead of the classical ones. I hope this will inspire you to think more creatively about your next domain name choice. Their website just launched in June this year. They offer daily fantasy football tournaments in the South and Central American market. According to Sebastian Hofman, one of the founders, "daily fantasy sports generate USD 4 billion in turnover annually. However, the concept still doesn't exist in South America, which happen to have the most passionate fans in the world. We wanted to be the first". You create your virtual team consisting of 11 real football players that you have chosen within your set budget. You then gain points according to how your players perform in the real tournament. A traditional fantasy football tournament used to take a whole season. Now you can play and win prizes every day. And more importantly you can show your friends who's the boss and win their money (everyone pays USD 10 to participate in a round). 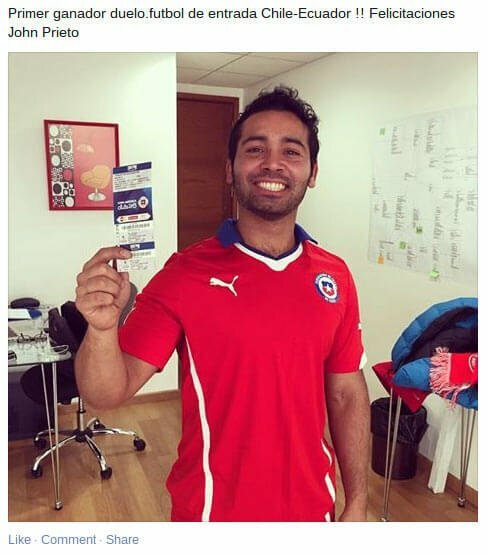 The site was launched coinciding with the Copa America (the national teams' championship in South and Central America), and this happy football fan was Duelo.Futbol's first winner. So why did they pick a .futbol and not one of the traditional top level domains? Sebastian Hofman points out that "this was an easy call. .com is too crowded and .cl is too local. Out business is regional, and .futbol therefore does its job brilliantly. We already have more products in the pipeline, and can therefore easily brand our products according to activity and geography". What have the reactions been to you using a .futbol? "Some people didn't get that it was a real domain name in the beginning. They expect you to say .com at the end. But they quickly get used to it, because it's so intuitive". How do you use .futbol strategically? 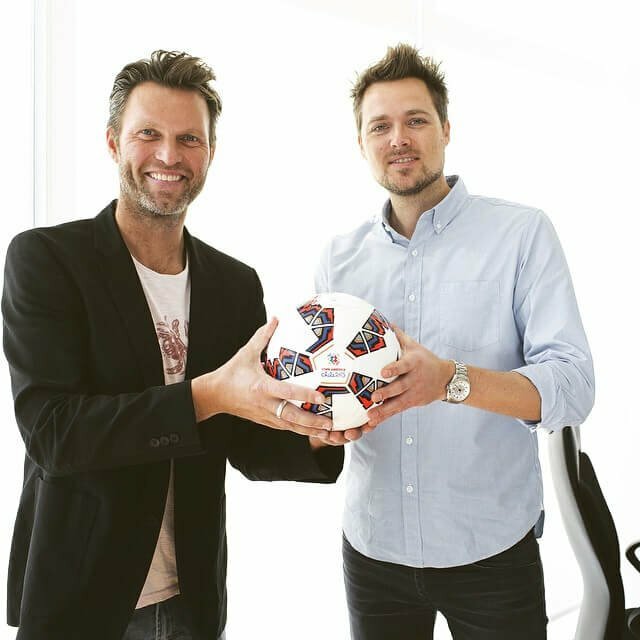 "Apart from using it for our official site we have entered into partnerships with some of the big media houses, which will have their own .futbol domain. One of these partnerships are with Claro, the largest telecom provider in South and Central America. They use dueloclaro.futbol as their web address. We also got hold of easy.futbol which will be the address of a game planner app". How did you manage to get short, catchy domain names such as easy.futbol and duelo.futbol? "We just went in and got them at GoDaddy some weeks after the general release. I'm still amazed that they were available". It's not a coincidence that this six man start-up is situated in Santiago, Chile. South America will be one of the drivers, when it comes to adoption of the new domain endings. In a recent study from ICANN by AC Nielsen 46% of internet users surveyed were aware of the existence of new TLDs. However in South America the awareness level was at 54% only beaten by Asia. North America was far behind at only 29%. We will follow the development in these regions and of course keep you posted, when we win a pot at Duelo.Futbol!